Public space is at the heart of democracy. It’s where people interact, teach, learn, participate, and protest. This city is a special place — we’re excited by its people and its neighbourhoods, its sidewalks and its graffiti. 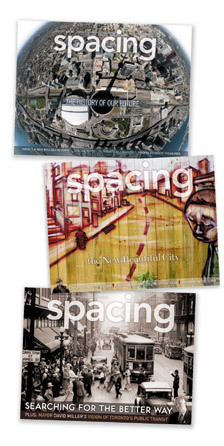 Spacing is here to help our readers understand and take ownership of Toronto's urban landscape. Sign-up for monthly e-newsletter: click here. Purchase a subscription: click here. Spacing is published three times a year and is available by subscription and on newsstands. Spacing's back issues can be purchased through our online store. If you order a subscription or back issues you should not expect to see those copies until the first week of the next month -- we process our orders at the end of each month. 7. Fall 2006 What kind of city do you want? 10. Fall 2007 Is Toronto ready to be a green city? Spacing is always looking for new writers, photographers, and illustrators to contribute to the magazine and our online publications. Please read over our Contributors' Guidelines before contacting us. As we are constantly receiving proposals from potential contributors please do not expect an immediate reply. We will try our best to get back to you as quickly possible. If you wish to write for Spacing, contact Todd Harrison [ toddharrison @ spacing . ca ]. If you want your photographic or illustrative skills to be considered contact Matthew Blackett [ matt @ spacing . ca ]. Spacing accepts paid advertising in the magazine and on our website. We have an extensive advertising/media kit which we can provide you in a PDF format or send it out to you through the mail. Download our ad rate kits for both print and online [PDF] or please contact our advertising director Matthew Blackett [ matt @ spacing . ca ] or call him at 416-644-1017. Spacing publishes a daily blog called Spacing Toronto which provides news, commentary, links, and events about public space topics in Toronto and from around the world. In January 2006, Spacing Wire was voted Toronto's Best Local Blog by the reader's of Eye Weekly. In November 2007, NOW magazine named Spacing Toronto the best blog in the city. In September 2007, Spacing made its first foray into another city -- we launched Spacing Montreal. This blog does everything that Spacing Toronto does except it does it in both French and English. Spacing also publishes a daily photo blog called Spacing Photos. Each weekday, a new photo from the public realm is showcased in concert with a monthly theme. Our contributors consist of the city's ever-expanding cast of photobloggers. In December 2005, NOW magazine 2005 Critics' Picks chose Spacing Photos as one of the city's best blogs. Spacing also opperates Spacing Votes, a blog dedicated to highlighting and discussing public space issues during elections. The magazine used Spacing Votes for the first time in the Toronto 2006 election and again in the 2007 Ontario provincial election. Spacing created a collection of 1-inch buttons that replicate the visual identity of each subway station in Toronto. The success of the series has been called the “civic pride fashion statement of the year” by the National Post, and earned the magazine numerous design awards. The buttons are available for purchase through our website or in Toronto retail stores. The release of each issue of Spacing offers the opportunity to throw a party and invite subscribers and readers. The magazine hires a local DJ or band, and programs the evening with activities related to the theme of each issue. These parties usually attract up to 300 people and have been held at legendary local establishments the El Mocambo, Arts & Letters Club, Gladstone Hotel, Berkeley Church, and the (now closed) 360 Legion Hall on Queen Street West. Spacing teamed up with Eye Weekly during the 2006 municipal election for The Political Party, a debate between the leading candidates for mayor. The event was held at Revivial, a renovated nightclub space housed in a former church. After the debate, a the new band led by Emm Gryner, The Hot One, performed their first Toronto gig. The event attracted 550 antendees and garnered numerous media features. Spacing co-hosts and programs Toronto The Good in partnership with ERA Architects, the Toronto Society of Architects, and the [murmur] project. The goal for each event was to bring together each partner’s respective sphere of influence and to invite them to mingle in untraditional places not often visited by the general public. From March 17 to April 21, 2005, Spacing presented a photo gallery exhibit called PUBLICity that showcased the work of seven of Toronto’s top photobloggers. Organized and curated by Spacing, PUBLICity was the first exhibit in Canada to focus solely on the work of photographers documenting their daily interactions with the city through digital photography and personal websites. The show at the Toronto Free Gallery featured Sam Javanrouh, Matt O’Sullivan, Rannie Turingan, Gayla Trail, Adam Krawesky, Jonathan Day-Reiner, and Davin Risk, all of whom contribute regularly to Spacing and own some of North America’s most popular photoblogs. In Transit took place over a five week period January 19 and February 28, 2006. In Transit focused on images of Toronto’s transit system. With over 25 participants, the exhibit brought together paintings, photography, and film focusing on the life of Toronto’s subways, streetcars, and buses. June 3rd, 2006 marked the 35th anniversary of the cancellation of the Spadina Expressway. The highway’s demise is one of the most seminal events to have shaped Toronto in the last 50 years. In partnership with the Humanitas Festival, Spacing brought together the neighbours, community activists and politicians who stopped the construction to celebrate life without the expressway. The garden party was held at the Spadina Museum, an architectural gem that would have been destroyed by the expressway’s path. The day’s speakers included Mayor David Miller and local TV journalist Adam Vaughan. From 2005-2007, Spacing hosted Public Space Invaders at the Drake Hotel’s Underground. Each night attracted up to 200 people and showcased short films, documentaries, and videos about Toronto’s public spaces. A workshop to help teach people how to beautify the abandoned bikes scattered around the city - June 5, 2005, Trinity Bellwoods Park. • Spacing has won Canadian Small Magazineof thr Year from the Canadian Society of Magazine Editors in 2007 and 2008. • Spacing won Silver in the 2007 National Magazine Award for Best Editorial Package for the Water issue (Summer 2007). • Dale Duncan was named Editor of the Year by the Canadian Society of Magazine Editors in 2008. • Matthew Blackett was named Editor of the Year by the Canadian Society of Magazine Editors in 2007. • Spacing Toronto was named 2007 Best Local Blog by Now Magazine. • Spacing was nominated in the 2006 Independent Press Awards for Best Local Coverage and Best Design. • Spacing won the 2006 Award of Merit in the publications category from Heritage Toronto. • Spacing received the Gold award in 2005 National Magazine Award for Best Editorial Package for the “The History of Our Future” issue (Spring/Summer 2005, #4). • In January 2006, the readers of Toronto’s Eye Weekly chose Spacing’s daily blog the Spacing Wire as the Best Local Blog of 2005. • Spacing has been nominated for Canadian Newsstand Award for Best Newsstand Issue three times, (2005, 2006, 2007). • In September 2005, Spacing’s subway button collection placed 3rd in the Top 5 “Wearable” Self-Promotion Items of 2005 presented by HOW Design magazine. • In October 2005, Coupe design magazine also showcased the subway button collection as one of 2005’s top design items. • In January 2005, the issue “Everyone is a Pedestrian” (Spring/Summer 2004, #2) was awarded the Best Single Issue Design by Applied Arts magazine. • In December 2004, Spacing was nominated for Best New Title in Utne magazine’s Independent Press Awards. Spacing wishes to acknowledge the financial support of the Ontario Arts Council.